[This logo will be the official logo of the VSA starting Fall '10.] 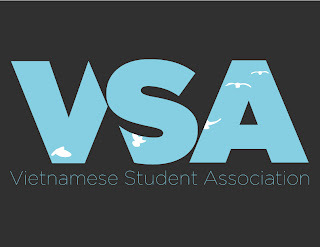 The Temple Vietnamese Student Association (VSA) decided that it needed a new identity that is simple and communicates the mission of its organization. The VSA is "dedicated to increasing cultural awareness and diversity on campus and in the community." It "hopes to provide the necessary interaction between those of different backgrounds to build cross cultural bridges and foster acceptance and awareness." As a "dynamic and open organization, VSA prides itself on its diverse and unified membership, and persistent dedication to decreasing cultural tension on campus." Given this information coupled with my research of other VSAs in Universities across the nation, I came up with this unique logo design. In researching, I found that a lot of VSA logos had included a visual of Vietnam from a map. People know what Vietnam looks like geographically, and so I decided I would not follow that trend. Instead, I decided to take a more modern approach in using the typeface, "Gotham Ultra" for strong impact. The logotype of "Vietnamese Student Association" uses "Gotham Thin." Between the two typefaces, there is lots of contrast. I trimmed some of the "V" and "S" to create symmetry between all three letters. Lastly, the decision to use doves, masked within "VSA," was aesthetic as well as symbolic of the VSA's mission. To "build cross-cultural bridges and foster acceptance and awarness," the doves are all connected, acting as a bridge as they fly across the logo. Symbolizing peace, and unity, the doves act as a great representation for the VSA.